Why is it that as fishermen we spend hundreds of dollars on equipment and invest hours of our time working to improve our fish-catching skills and yet spend so little time working to improve our fish-playing skills? I started fly fishing when I was about 11 years old. My dad and I went to Newman-Stern, Co. in Cleveland, Ohio and he bought me a Berkley Fiber glass rod outfit just before I went off to summer camp. I still use that rod...and Pflueger reel! That was all it took to hook me for life. As Norman McClean said in his novel, A River Runs Through It, fly fishing is a religion. It's one of my passions. Family comes first, after that, fly fishing, baseball, skiing, home renovation, backpacking/camping and the shooting sports. I had been a crummy caster for years and attended the Kaufmann's casting school on the Deschuttes River in Oregon with my dad back in 1994. I went there after erasing the ole' memory banks of all of my bad habits. After three days of intensive instruction, I had improved 100%. I learned the correct mechanics and much more. It was my first introduction to a different dimension to fly fishing. The PASSION! That school set me on a mini life-quest...to become the best caster I could become. The famous Western guide Dec Hogan was one of the instructors at the school. John Hazel was the flagship instructor there at the time. Maybe so, but Dec Hogan is one of the finest casters and fishermen I have ever witnessed first-hand. He is simply amazing to watch; and his absolute passion for the sport is quite literally intoxicating. 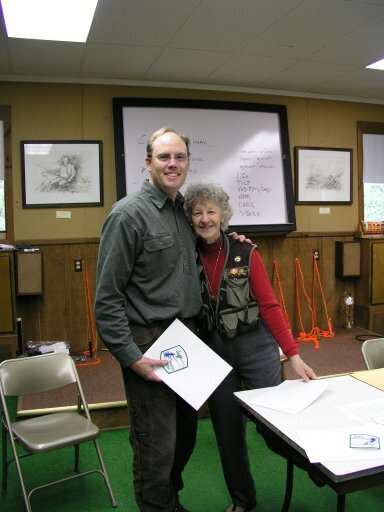 Upon a recommendation from a close fishing buddy of mine, I attended Joan's casting school a few years ago. It had been about 9 years since I had attended the Kaufmann school and I was ready to get to the next level. After three days of extremely intensive casting instruction by arguably, the finest teachers in the industry, I was again transformed. Joan told me to practice every day for a year if I wanted to master casting. I practiced virtually every day for a year; sometimes for only 5 minutes if it wasn't working for me. After a year, I finally realized what she was talking about. My muscles had memorized the mechanics. I again was re-vitalized to get to the next level. A few years after the casting school I attended Joan's instructor's school. Learning how to cast properly is important. Becoming a good caster is only one side of casting. Teaching others to cast is an entirely different matter. Teaching a person how to teach is what this school is all about. After the exhaustive training, I was ready for the final exam. I couldn't bare the thought of waiting so I volunteered to go first. Realize that all of the people at this school are guides, very fine casters (a pre-requisite is at least going through Joan's casting school) or FFF certified instructors. I could select any of the other students to be my partner. They would intentionally do things wrong somewhere in their casting stroke. I had to quickly analyze what they were doing wrong, explain it to them and then correctly teach them how to do it right in a manner in which Joan and the staff felt the student would/could understand. All the while doing this under the strict eye of Joan Wulff and all of her master instructors. It's serious business. After I finished, master teacher Floyd Franke said, "Well done! You can be my teacher any time"! After I received my "diploma" from Joan, I vowed to pass the skills I had developed on to others. Yee haw!! Update on Joan's school: According to sources, Joan may not be teaching the regular casting classes (although I think she still is heavily involved) and is only teaching the instructor's class. I am not sure what the status of classes will be going forward. Her son Doug is running things now. If you have any desire to be taught by the best in the business, you had better not waste any time. Joan Wulff instilled in me the need to continuously instruct so that you stay in practice. Between family, work, coaching baseball and eveything else, it's tough to find the time. I do try to instruct at least once a month though. I like working with kids and their parents together.